In the Yungdrung Bön tradition, there are three mantras that collectively embody the entirety of the teachings of the enlightened Lord Tönpa Shenrap Miwoché. They are commonly known as the Nyingpo Namsum, the Three Essence Mantras. The Yungdrung Bön teachings are like an ocean. There are 84,000 teachings. These can be condensed into the Nine Ways of Bön. These Nine Ways can be further condensed into the three views of sutra, tantra and dzogchen. These three views can be condensed into the Three Essence Mantras. That is why they are called ‘Essence’ mantras. Practicing these Three Essence Mantras can bring the result of practicing the Nine Ways of Bön. Even simply reciting these mantras with faith and devotion without understanding their meaning or individual practices can bring blessing and power to the practitioner. During the preliminary practices which prepare the spiritual practitioner for further development and advanced practices, each of these Three Essence Mantras are recited 100,000 times. It is common for even Bönpo laypeople to recite each of these mantra a minimum of 108 times every day. During recitation of any mantra, it is proper to not engage in any other kinds of speech and to refrain from eating, drinking, coughing, sneezing, spitting or any strong expulsion of breath. In this way, the power of the mantra is not lost or diminished. Once the recitation is complete, it is traditional to blow onto the mala and therefore bless it with the energy of the mantra. the practitioner can also blow the energy of the mantra recitation onto any areas of pain on the body, to the heart area, or onto food and drink. To fully receive the benefit and blessings of reciting any of these Three Essence Mantras, it is essential to receive transmission for them from an authentic and qualified Yungdrung Bön lama. 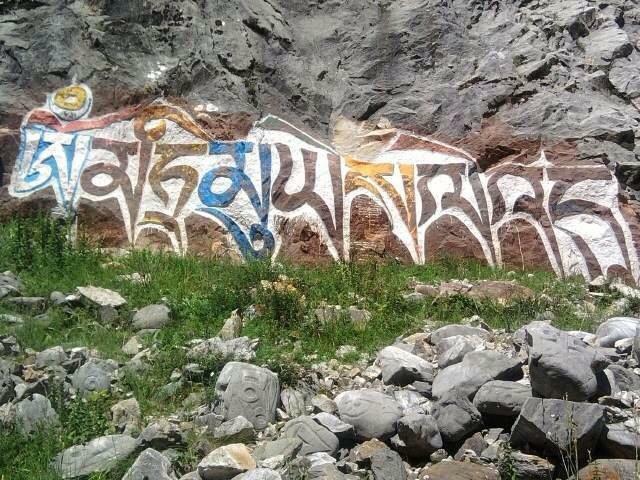 Because this is the Essence Mantra of the Dzok ku, it is related to the tantric view. This mantra is commonly called the MA TRI mantra and is also known as The Great Mantra. This essence mantra embodies the energy of Lord Tönpa Shenrap Miwoché and Sherap Chamma, the Wise Loving Mother as well as Buddha’s six enlightened manifestation in each of the Six Realms: hell, hungry ghosts, animal, human, demi-gods, and god. These six manifestations of Buddha Tönpa Shenrap are known as the Six Subduing Shen. Each year around the time of the Tibetan New year in Dolpo, this mantra is recited continuously, without any interruption, for 15 days. Because this is the Essence Mantra of the Tul ku, it is related to the sutric view. This mantra is commonly called the DU TRI SU mantra. The first four syllables represent the Dershek Tsozhi, the Four Principal Enlightened Ones of Yungdrung Bön who are Satrik Érsang, Shenlha Ökar, Sangpo Bumtri and Lord Tönpa Shenrap. The following syllables represent purification of the lower realms and protection from inner and outer negative forces. According to the Great Lama Drenpa Namkha, if this mantra is recited and blown to the sole of the feet of a sentient being that is dying, it is pushing the being’s conscious towards the crown of the head and that being will not be born into the lower realms. Also, if one experiences nightmares, reciting this mantra in the morning will dispel the negative energy. 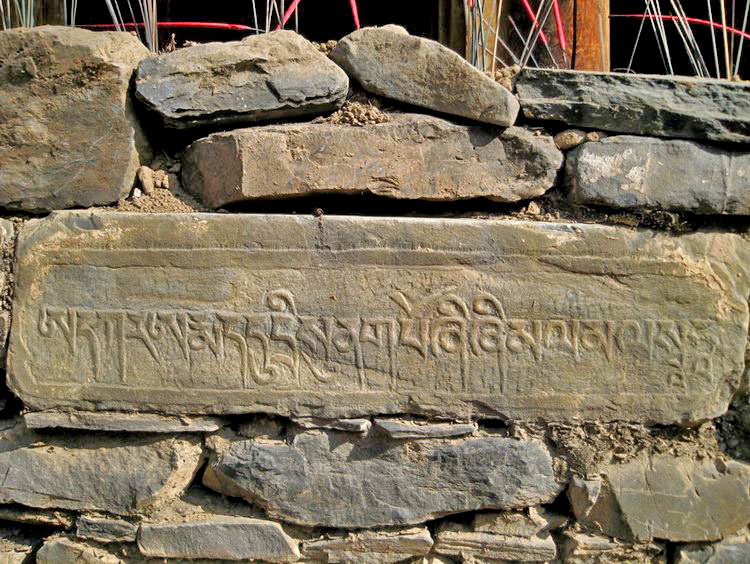 In the Himalayan region, it is traditional for a Bönpo family to have one or all of these Three Essence Mantras carved into wood or stone and hung above the entrance to the home. 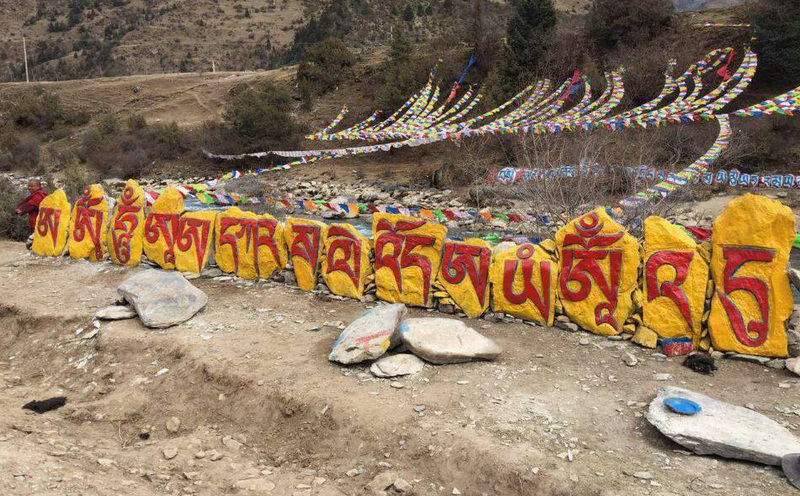 Carving these mantras into stone, printing them on prayer flags or wearing amulets containing these mantras brings immeasurable blessings and protection. Posted on July 4, 2016, in Sacred Scriptures, Uncategorized. Bookmark the permalink. 4 Comments. Thank you for your wonderful posts! Do you know of a good audio of the essence mantra of the Bon ku? Thank you Raven! I was pleased to learn of the traditional order of recitation … had not previously known that. Thank you, Raven, for this detailed post and sharing the beautiful photographs. If you have the Soundcloud app, Geshe Tenzi Yangton has recorded a beautiful recitation of this mantra. Search for ‘Tenzin Yangton’.